If you’re planning on getting a new puppy you need to be prepared. Even if you’ve had a dog before it’s good to refresh your memory on what you need to do to get ready for a new young dog to come into your home. Puppies bring their own challenges but they can also be the most rewarding addition to your family. Let’s take a look at the essentials. We’ll take a look a a number of areas you need to be aware of, from choosing your puppy, avoiding damage from chewing, getting ready for potty training and more. Nothing is more exciting than bringing home a lovable four legged member of the family. Dogs bring so much joy and laughter to their owners – plus they give unwavering love and loyalty. But when you add a new puppy to the fold, you have to remember that there might be some period of adjustment because having a puppy can be a little like having a new baby at home. They have to have their needs met and be taught acceptable behavior from non-acceptable behavior. There are many advantages for getting a new puppy rather than a fully grown dog. One is that most puppies don’t have any bad habits already ingrained in them so they’re open to your style of training. Where to start with a new puppy? You’ll need to make sure you research different breeds and get the right puppy to suit your lifestyle and commitments. Obviously there are small, medium and large dogs. You’ll want to choose the puppy that you get depending on your lifestyle, your home and the members of your family. Some dogs are better suited to families where they’re the only dog. Other puppies work better when there are multiple dogs in the home. Puppies that get large pretty fast such as German Shepherds or Great Danes don’t always realize their strength or size when they play. So you’ll want to keep that in mind if you have small children in the home. You’ll also need to take into consideration whether you have a large yard or whether you live in an apartment. Some medium to larger dogs have endless energy and need space to run around during the day (and this is in addition to being taken on walks). You’ll need to know if you want a purebred new puppy or a mixed breed. Both have a lot to offer a family and can be great pets. After you figure out what kind of puppy you want to get, you’ll need to decide where to get your new puppy from. You do have lots of options. There are pros and cons for getting a puppy from someone whose dog had a litter versus getting one from the local shelter. When you choose to get a new puppy from someone whose dog had a litter, you can know the puppy’s breeding history. You’ll be able to see the puppy’s parents. This can be helpful in determining any type of health issues that your puppy might face in the future. One thing that you do want to avoid is getting a puppy from a puppy mill. These are places that breed dogs solely for the purpose of making money, usually forcing the dogs to have litter after litter often before it’s safe for the female dog to breed again. There is little thought given to the well being of the breed dog or the puppies. Puppies from puppy mills are often neglected, have numerous health issues and are often not well socialized. These puppies are often kept in inhumane conditions. By buying a puppy from one of these places, you’re giving money to keep that business operating. These places are usually operating without a business license and try to fly under the radar to avoid being shut down. When you choose to rescue a puppy from an animal shelter, you’re helping to save the lives of not only your puppy, but other ones too. These puppies are loved and well cared for, often by volunteers, and can make fantastic pets. Some pure bred dogs are prone to health problems like hip dysplasia. By rescuing a mixed breed puppy from a shelter you may be actually getting a healthier dog in the long term. Before you ever bring the new puppy home, you’re going to want to be prepared for your new puppy. Because puppies are a lot like human babies, they’re going to go through a teething stage. You’ll want to go through this stage with them by making sure that you give them something that they can chew on. Puppies that are teething have been known to chew on whatever they can find to help meet that need. They’ll chew on the legs of your furniture, your shoes and even on the edges of walls that protrude out enough for them to be able to bite. Not only will this be a habit that you don’t want to put up with, but it has the potential to make your new puppy sick and even cause his death if he ingests something that will harm him. So you’ll need to make sure that your new puppy has some puppy toys that he can chew on. Buy the ones that are puppy age appropriate. Make sure that these toys are strong. You might have to spend a little more to get a good chew toy since the cheaper ones are usually made of materials that will tear easier and you don’t want that. Next, you’re going to need to make sure that you have a supply of dog food. Since your new puppy is still a baby in dog years, you’re going to need to purchase his food according to his age. Many brands will have their foods listed by dog age to make it easier for you to choose. Pick the brands that are known for their high nutritional level or are recommended by veterinarians. Your puppy is going to need more calories at his age than an older dog will and you should change his food based on his nutritional and calorie needs as he grows. It is best to use a high quality commercial dog food at this stage rather than raw food. This is because your puppy has particular nutritional requirements at this age. And if you’re not completely accurate in the nutrients you provide then your puppy may be missing out on what he needs to grow and stay healthy. If you choose to change to a raw food diet later than can be done. Remember not to leave your puppy’s food out all day. Your new puppy needs to have regularly scheduled meal times. After food, you’ll need to think about where your new puppy is going to sleep. In the bed with you is NOT a good option at this stage in his life. Not only could your new puppy fall off the bed and get hurt, but he could also pee on the bed, making it uncomfortable for both you and him. A puppy needs his own space and puppies prefer an enclosure. It makes him feel safe. The first bedding option for a new puppy that still needs to be potty trained is a dog crate. You’ll want to buy one according to his size and make sure that there’s something soft for him to lie on inside of it. You can find a doggy bed that’s crate sized. The reason it’s a good idea to put a puppy bed in his crate is because dogs are reluctant to go to do their business where they sleep, so this will help in the potty training phase. But just a word of warning. If you buy a dog crate that is too large for your puppy there is plenty of room for your puppy to pee inside the crate and yet still feel comfortable on the other side. For this reason you should get a crate that has enough room for your puppy to lie down and be comfortable but is not so big that he is happy to pee in it. Just like babies, puppies want to get to know their surroundings. They’ll find things that they want to check out and if you’re not careful, they can easily get into something that’s not healthy for them. Because of that, you’re going to want to puppy proof your home. It really isn’t that different than preparing for a baby in the house. Don’t leave things on low tables such as end tables that your puppy can knock over and get into. This includes things like medications, plants (because many of them are toxic to dogs) batteries, and hair clips or hair bands. Keep your puppy out of the bathroom. Like human babies, puppies are top heavy and can fall headfirst into a toilet and can struggle to get out. Buy a toilet seat latch to keep your puppy safely away. Keep anything sharp or medicinal out of your puppy’s reach. In bathroom or in the kitchen, don’t leave anything that you use to clean your home within the dog’s reach. Some puppies quickly learn how to flip open a cabinet door. You can buy cabinet latches to prevent him from being able to get into stuff that could harm him. Anything that sticks out is something that your puppy will find fascinating. This includes cords on appliances, gaming devices and more. If he’s not watched, he’ll quickly start chewing on the cord, not realizing that he could get hurt. And it can end up being very expensive for you! Keep all cords out of your new puppy’s sight. One thing that puppies love to chew on is a sock. Because puppies do have sharp teeth, they can easily separate some of the material and swallow it. When a puppy swallows any kind of material, it can cause a blockage in his intestines and this can be a medical emergency for your puppy. Yarn, string, thread, and dental floss are also often targets that puppies love to chew on. Keep these and small objects out of his reach. Puppies love to run and they don’t have the experience or the coordination to navigate stairs with skill. If you live in a home that has a set of stairs, then you’ll need to use a baby gate. You’ll want to have one stair gate for the top of the stairs and another one for the bottom of the stairs. When you’re in the kitchen cooking, make sure that your puppy isn’t underfoot. It can be easy for him to get burned by a hot stove, especially if hot liquid gets spilled. You may want to use a baby gate across access to the kitchen to stop your new puppy going too close. Keep anything that you would eat away from your puppy and only feed him food designed for him. Puppies don’t have the right digestive system to be able to handle the foods that humans can eat and some of these foods can be fatal to them. If you start when you first get your new puppy, it won’t take you long at all to get him accustomed to doing his business outside. Potty training is one of the reasons that you’re going to want to buy him a crate. This is the easiest and most reliable method for training him in this area. You have to be patient with your puppy because accidents are going to happen. Remember that he’s little and when the urge to go hits him, he doesn’t know any better than to just go when he needs to, wherever that is. The younger the puppy, the more difficult it might be to train him. A good rule of thumb to keep in mind is that for a puppy, when food or water goes into his system, he’s going to need to go to the bathroom within about half an hour to forty-five minutes later. You have to be consistent and you have to keep him on a regular bathroom break schedule. As he grows older during the potty training phase, you can slowly start to extend the time between his bathroom breaks. But in the beginning, be as consistent as clockwork at getting him outside. The minute you get up in the mornings, take your puppy outside. Do this before you get into the shower of have coffee or anything else. He’ll learn to associate waking up with having to go outside. Always make sure that you take him outside through the same door. When you do this, once he’s trained, he’ll let you know he needs to go by standing in front of that door. Every half an hour throughout the day, take him outside. If you can’t be home during the day for extended periods of time, you can’t leave your puppy and expect him to hold his urge. Someone will have to be there to care for him while you’re gone. Regardless of how much time has passed from the last time of his bathroom break, after he eats, get him outside. He’ll learn to associate eating with going to the bathroom. Puppies do have shorter digestive tracts and their food will pass through their system quickly. Your puppy needs to have a designated area to do his business. The reason for this is because he’ll also learn to associate that area with needing to eliminate. Every single time your puppy does his business, you need to give him something as a reward so that he recognizes what he’s done as good behavior. You can use doggy treats for this. If you catch your puppy in the act of squatting in the house, you need to startle him to get him to stop the behavior to get him outside. You can startle him by using several pennies in a can and shaking it vigorously and saying no. Puppies are eager students and can be taught what’s right and wrong behavior. But if they’re left to themselves, you could end up with an overgrown furry baby who won’t listen to you. Dogs will either follow or they’ll lead and if you don’t lead them, they can develop destructive habits that can be dangerous for them or for you. You want your puppy to know that he has to listen to you. You can enroll him in obedience training lessons, but if you’re willing to put the work in, you can also teach him yourself at home. Just make sure that you praise and reward his behavior when he gets it right. He needs to learn what he can and can’t do. Puppies respond best to reinforcement and if you don’t stay consistent, you can’t expect him to either. They need to learn a few basic commands such as come, stay, down, out, in, quiet and no. You can add to words he’ll be able to associate with meaning as you go along. Puppies are all highly intelligent but they don’t have the ability to understand commands that are several words long. Keep the words you use simple. So instead of saying, “Come over here to me” you would only teach him to “come” and most puppies will willingly run to their people whenever they’re called. When he does come whenever he’s called, reward him with praise and a treat. Teach a puppy how to stay by pressing gently on his hindquarters while you say the word. Then slowly back away. If he gets up and comes toward you. Repeat the lesson. When you back all the way up, then reward him for staying. Puppies love to jump up on people. It’s how they show affection. But they can accidentally scratch people or injure a child. Teach your puppy “down” from the first time he jumps on someone. Every time you take your puppy outside to do this business, tell him, “out” and then when you return to the house, say “in” and he’ll learn to associate those two words with being outside or indoors. Should you quieten your dog? When a puppy barks, many pet owners will immediately say, “quiet” but there are times when you don’t want to do that. Barking is his way of communicating. Sometimes he’s doing it because he’s trying to tell you something. If someone knocks on the door and you say “quiet,” you’re teaching him not to protect his home and you don’t want to do that. A puppy will bark just like a baby will communicate by crying. It could mean that he’s tired, bored, hungry, lonely, afraid, or wants to go outside. Make sure you only use the word “quiet” after you’ve checked everything out and ensured that he’s not trying to alert you to anything important. Preparing for a puppy can be a lot of work, but it’s rewarding when your four-legged friend is well-trained. If you start early in your training it will be easier overall. 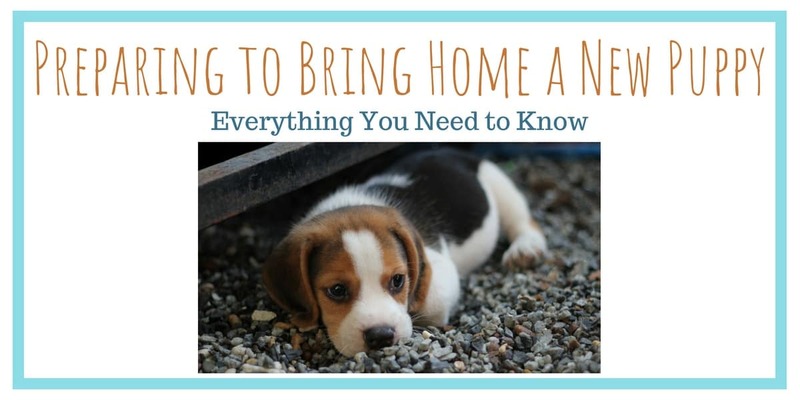 Get what you need before you pick up your new puppy for the first time and be prepared. You’ll be loving the whole new puppy experience! ⇒ Do you need a Dog Stroller? Here are some of the best. ⇒ Want to know how to clean your dog’s ears? See here. ⇒ Did you know you can clip your dog’s black toenails at home? See here. This entry was posted in Dog Training on August 10, 2018 by Didi.